We are a Passport photo studio based in Paddington, London that specialises in taking passport photo and visa photo for Iran. 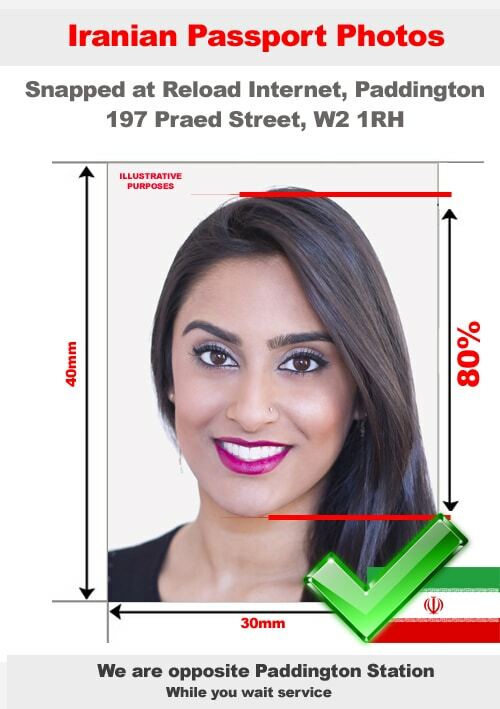 We can take your Iranian passport photo or visa photo in our store and our fully trained staff will photograph you with the right lighting and the correct background that the Iranian Embassy requires. We can print and prepare your Iranian passport photo or visa photo while you wait in our store with no appointment needed. At Reload Internet we open early and close late every day of the week, allowing you to come and have your Iranian passport photo or visa photo captured, printed and cut at a time that suits you. All of our photographs come with a guarantee to pass when submitted to your chosen Embassy first time round! Watch the video on how efficient we are with Iranian passport and visa photos. Do you recognize the actor? You need to make sure that the passport photos you submit are 100% embassy approved and sometimes instant photo kiosks will not be able to meet these standards. We have had countless customers visit us, due to them being declined when using photo-booths, in order to get the right specifications of a Iranian passport photo or visa photo. Choosing Reload Internet to get your Iranian passport photo and visa photos, and we can help you avoid an embarrassing or frustrating declines that could occur at the Iranian Embassy. At Reload Internet we will ensure that we are able to supply you with a crisp, clear passport photo for Iran. As with most Embassies, the passport photos you submit with your passport or visa application will need to be more than six months old – and at Reload Internet we will ensure that there we remove all red eye or any shadows in the background (or even from your face) that can affect the quality of the passport photo for you. This is exactly what we will produce and we will email it to you after you visit our studio in Paddington, London. We look forward to welcoming you.